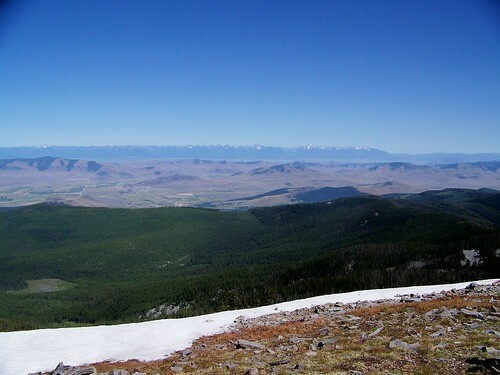 “it’s important I have written proof that Montanans don’t want members from New York and Connecticut dictating our land-use policy” (this is taken from a press release by Denny Rehberg, Montana’s sole member of the House of representatives, concerning his opposition to the Wilderness Bill, H.R. 1975. In the opening sentence of that release, he also called it a bill, “which would harm public access and recreation in Montana”. 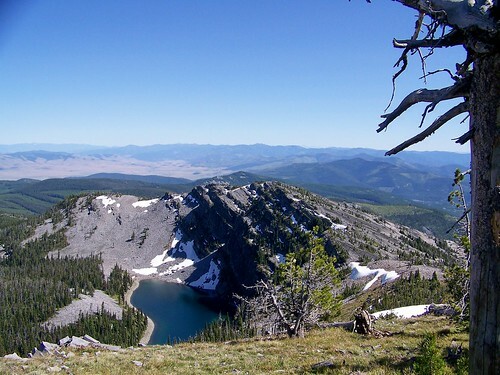 It seems that every time an issue concerning the preservation of our National Forests or Parks arises, Montana’s representative the the House, Denny Rehberg, and Senator Max Baucus, throw their heads back and start braying about “public access” and outsiders “dictating our land-use policy”. Some 50 miles south of Billings Montana lie the Pryor Mountains, a 78,000 acre high-country zone partly in the Custer National Forest. The Pryors now face a huge problem: unmanaged ATV and dirt bike riders are scarring the land, using and creating illegal trails through large parts of that area. In a recent edition of the Billings Gazette, is printed a letter by a person defending the Pryors. Here is a link to the letter: Don’t let Pryor Mountains get chewed up by ATVs. 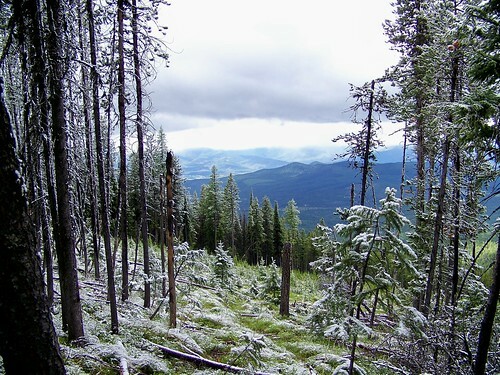 The letter itself is not all that informative, but if you are interested in seeing what some of the local people think “public access” means and why it will take outsiders to protect the National Forest lands in Montana, read the comments after the letter. It suggests to me that Montanans are more interested in playing with their motor toys than they are in protecting the environment! The Custer National Forest is asking for comments on their new plan for this area, and the comment period is now open until December 19. This is a National Forest issue and therefore concerns not just the residents of Montana, but all of the citizens of the United States. 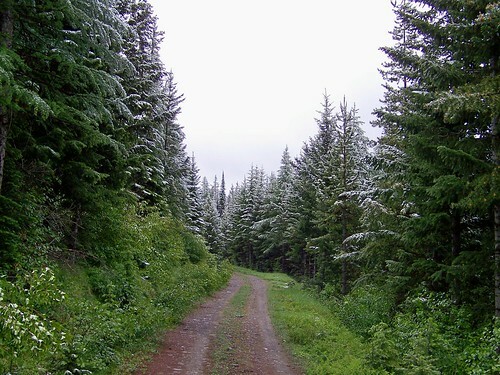 For those of you interested in making your opinions known to the Forest Service about OHV use in our National Forests and helping make a difference, the following link will take you to the website of the Pryors Coalition where you will find more information about the situation in the Pryors and information about how to send your comment to the Forest: YOUR VOICE COUNTS! Beyond the town, and another 40 miles away, the majestic Mission Mountains. 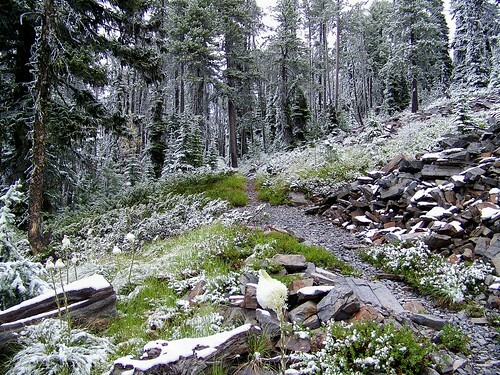 A few more degrees to the south and just below the peak, Baldy Lake. 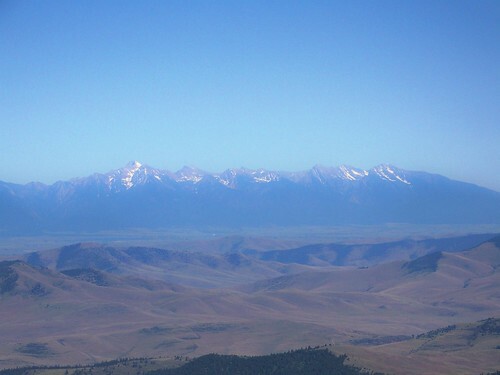 Photographed June 26, 2007 from the summit of 7,464 ft Mount Baldy in the Cabinet Mountains of Western Montana. 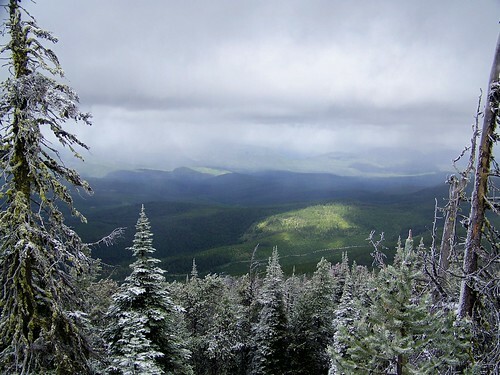 From within the Baldy Mountains roadless area. What a difference a day can make. 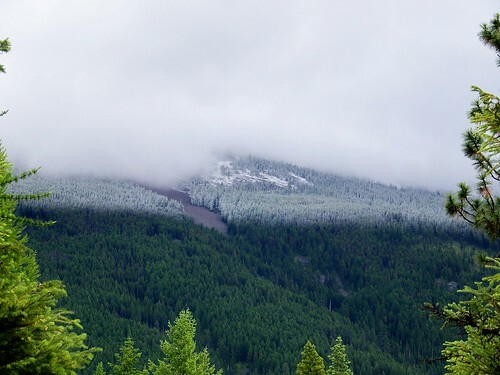 On Monday the high temperature in the valley was 64º and there was new snow on Mount Baldy. On Tuesday the valley high was 78º and the snow was gone. All but at the top. This is the first of several posts I will make about a hike to the top of Baldy and I decided to start at the top. 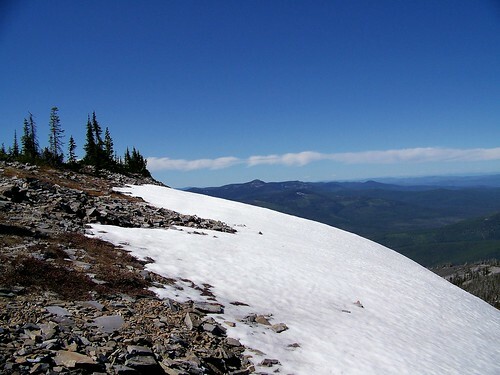 There are still a few snow banks remaining at the high elevations, mostly on the north slopes where the snow drifted deep during the winter and where they are normally shaded from the sun. Some are still as deep as 7 feet. 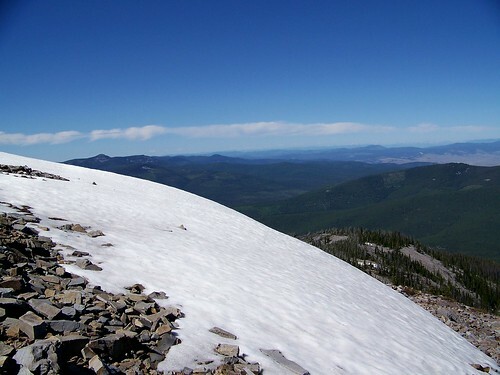 These photos were taken Tuesday from the top of Mount Baldy (7,464 ft). Looking Southeast. 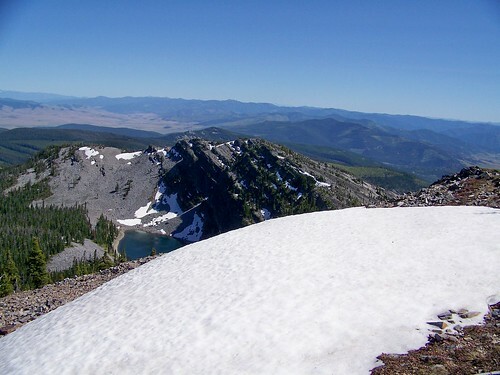 The small lake is Baldy Lake. I will post another photo of it later. It’s probably still a little cool for swimming. The next three are looking over different snow banks to the North. 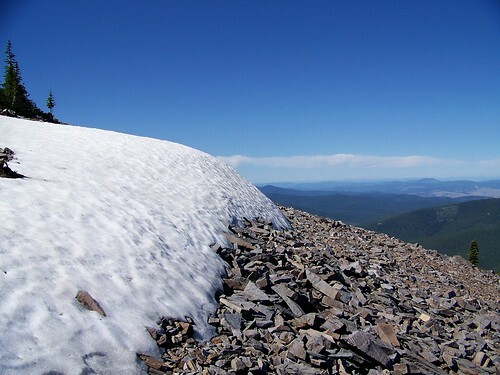 The high peak just above the snow banks is Thompson Peak in the McGregor – Thompson roadless area. It is the same height as Baldy and is 9 miles away. 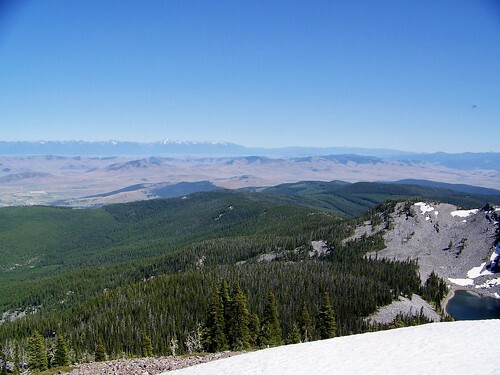 Mount Baldy is in the West end of the 6,482 acre Baldy Mountain roadless area in the Cabinet Mountains of Western Montana, Lolo National Forest. 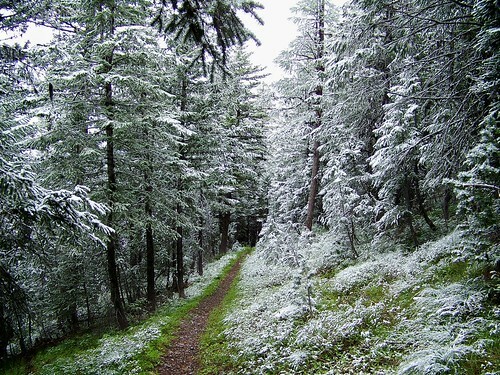 It would receive Wilderness designation and protection under the Wilderness Act, HR 1975 if it is passed by Congress.